Leeds first 24hour Diner, Rosie's Diner, opened its doors on Monday offering early birds and night owls alike an extensive American themed menu with a warm, family- friendly atmosphere. 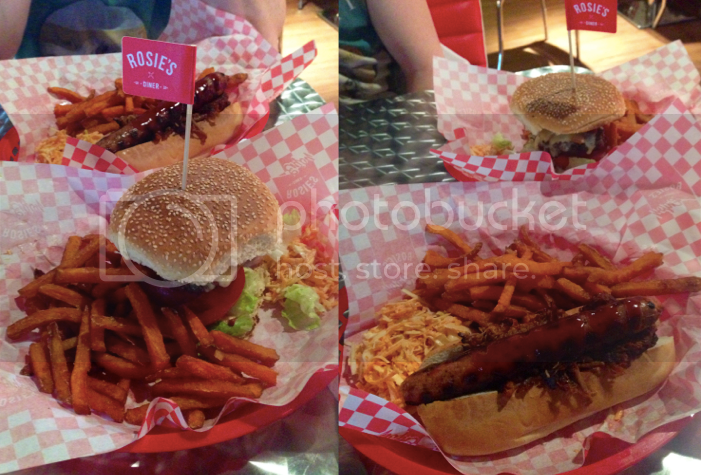 It didn't take long for us to give in to the temptation of nearby pulled pork and burgers, so me and the Boy took a trip down on Wednesday to see what Rosie's had to offer. The Diner itself is beautiful, complete with a Monster Truck parked out front and an all-american yellow school bus finishing off its 1950's-esque decor. The music was straight out of Grease and I couldn't help but to sing along whilst sipping on my chocolate milkshake. The food was lovely. I had the Yorkshire Terrier, a hot dog topped with pulled pork and it was everything I wanted it to be, whilst the Boy had The New York BBQ Burger. He said that it was one of the nicest burger patties he had tried (rivalling the amazing Mr. Nice Guys there). You could actually see the chefs making up the burgers in the kitchen from where we were sat, and the fact that they use 100% Yorkshire Beef and source local ingredients really sets it apart from other high street chains. We both had the sweet potato fries, which were DELICIOUS. The New York BBQ Burger and the Yorkshire Terrier Hot Dog both served with home made slaw and sweet potato fries. 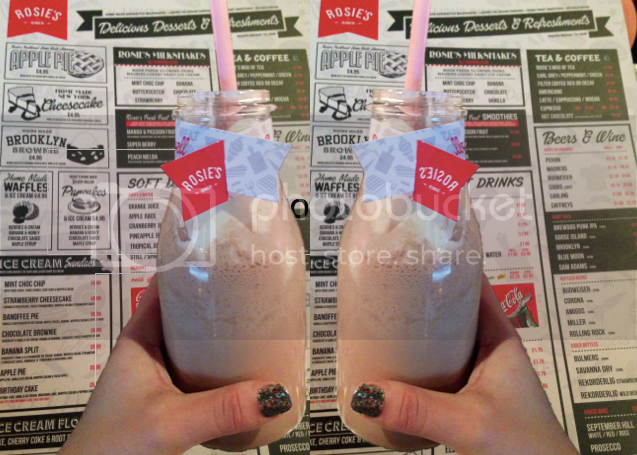 Rosie's Chocolate Milkshake served in a vintage milk bottle, so cute and it tasted so good! Whilst we were eating, I couldn't help but cast my eyes around and feast my eyes on everything the other customers had ordered (this was the reason I ended up getting one of their milkshakes! ), and everything looked incredible, their 'Blooming Onion' had me curious and their Steaks had me almost drooling, don't even get me started on the desserts... for some reason my 'dessert stomach' did not kick in this trip... Next time! The food is reasonably priced and the Diner attracts custom from all types of people, the Bus had young children playing with etch-a-sketches, the floor had couples and friends alike and the bar seated a group of girls enjoying a bottle of champagne and cocktails. It genuinely has such a great atmosphere. Rosie's Blooming Onion. I NEED to try this. How incredible do these sliders look?! The only problem with Rosie's was the waiting time. We waited 45 minutes to be seated and when we were eventually seated we seemed to have been forgotten about, and did not have the chance to order for another 30 minutes. After drawing this to the attention of the staff, they were beyond helpful and extremely apologetic, even giving us a discounted meal and a discount card for future visits. Justin, who was our waiter, was incredible and is a complete credit to the Rosie's brand, he really made the whole experience more personal and he definitely knew his stuff. I think this minor hitch could be put down to the inevitable teething problems of a new restaurant opening and new staff learning on the job. The food was well worth the wait and the rest of the Diner was full of customers enjoying it and the atmosphere. The fact that Rosie's Diner is always open is just fantastic, how often do you get a late night hankering for dessert and not a soul is open to fulfil it?! It might just be me on this one, but I genuinely can't wait to go back and sample the rest of the menu. I fully recommend it to everyone! I can't wait to go back just to try it! it looked incredible. You're pretty generous in this review given that they made you wait over an hour before they even took your order. It took an hour for our food to arrive and all the customer comments currently visible on their Facebook page are one-star reviews. There were lots of things we couldn't order because they'd run out. 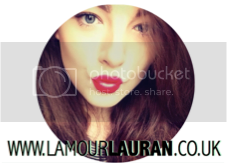 The food was really nice and the staff really helpful and lovely. We could see many other tables being served promptly and who were enjoying their orders. As with a lot of new restaurant openings, service was delayed, and they are open 24 hours a day 7 days a week, so I don't think you can blame them for running out of popular dishes. I've been back to Rosie's since and really enjoyed it.